As I stated in a previous post, I have a fetish for displays. Any display. Again, while searching eBay for some parts for my Half-Byte Console project, I found a small, .96 inch OLED display. 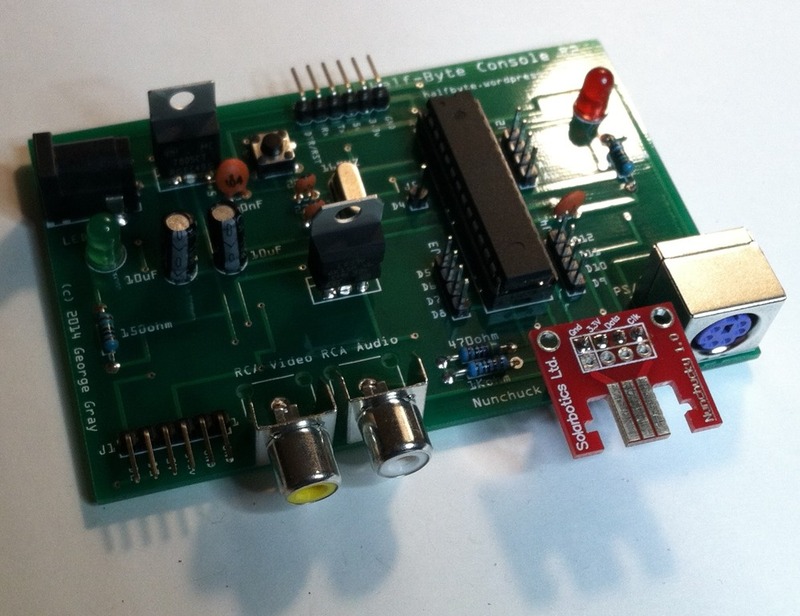 This little gem uses either SPI, Serial or I2C to interface with your device. I ordered one and received it a few days ago. As is with most of these cheap parts from China, there was little in the way of documentation or code. Fortunately, more than one vendor sold them and I found some code, which was good since none of the code I found on the net seemed to work. This little display is advertised as monochrome, but it really is a two color display. The top two lines have a yellow background OR yellow foreground and the rest of the screen is blue on black or black on blue. It was likely out of an old cell phone. To be honest, I’ve not done much research on the history of the screen itself. Of course, VCC goes to either 3.3v or 5v and GND to ground. Once the hardware was connected, I uploaded the code I found. The code, found here (but, download it from here, instead), was a simple demonstration and did not come with a very versatile library. Though, it does appear to use the Adafruit GFX library. At six dollars, the screen isn’t really worth it, as there are better screens out there for the same or even less. However, if you can these cheaper, they will make great little status displays or even part of a smartwatch or other wearable device. A note about the AdaFruit libraries: While provided free of charge, developing these is not always an easy task (though, it might for Lady Ada) and, as such, you should patronize them whenever you can. They have a great selection and good pricing. I buy quite a bit from them. The display is also capable of graphical display, but I’ve not yet bothered to try and put an image on the screen. There is a bitmap function in the limited library, but you must convert your image to a C array first. Take a look at the header file for the OLED font. // Uncomment whatever type sensor you are using! Thanks for the link to the IIC_without_ACK files. It’s not using the Adafruit GFX library at all, there are only the functions IIC_SetPos, Fill_Screen, Char_F6x8 and Draw_BMP available. The data for the BMP is in file oledfont.c but I haven’t figured out what format it has to have. 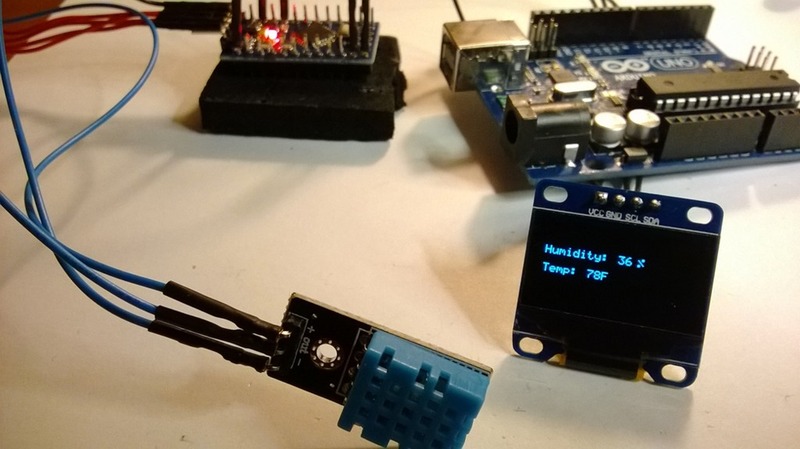 To get the module working with the Adafruit_SSD1306 library, I needet to find out the I2C address using an I2C scanner: https://github.com/todbot/arduino-i2c-scanner. 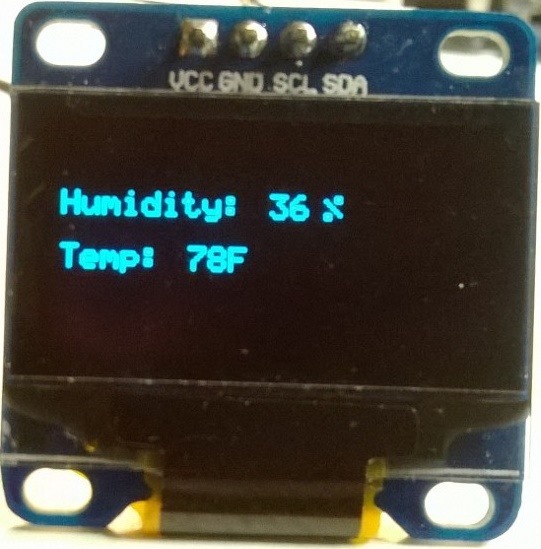 My display had the address 60 (0x3C), which has to be changed in ssd1306_128x64_i2c.ino. Thank you for the kind comments and the information. I plan to do a follow up post about this nifty little display. Hi please can you help me,i cant get the sample code to work,there loads of errors,ime copy and past it all,ive installed the librarys too,have you just joted the code roughly? HI Duncan, sorry for the delay in responding. The code I posted worked for me. If you could let us know what errors you get and the code you are using, we would be happy to help. Correct that line above and it should compile. I am running most of the code in another project and ran it here without problem. I suspect the formatting got hosed when I posted it. Hi,its still the same,what version of arduino IDE do i use? I don’t normally do this, but…will in this case. Send me your sketch. It looks like, judging from this report, that an INCLUDE is not complete and that there are some typos. If you send me your sketch, I’d be happy to help you get it working. Send me your sketch, I will take a look at it. What I’ve done to fix it is change the DHTPin line to separate into 2 lines and replaced all instances of dht with DHT which removed some errors but beyond that I’m stumped, are you able to help? Part of the problem is that, at least what you posted, is missing several INCLUDE statements, the quotes are wrong (” instead of “, did you use Word?) and there are non-ASCII characters in the source. If you copied from this web page, you need to paste in NOTEPAD then save that. Pasting into anything else that does not strip non-Ascii characters will result in awful things. So…fix the INCLUDES and that should correct the ‘was not declared in this scope’ errors. Fix the quotes everywhere. The thing that stumps me are the lines about the backslash. Have not figured that out yet. I suspect it has something to do with copying from the browser and pasting into Word or the IDE. has probably snaffled them up, they are there in the IDE though, which is where I directly pasted. OK, I think much of the problem stemmed from copying the source from this page. I tried it and got many of the same errors. Looks like WordPress may have changed the quotes, and nothing you did caused that. Also, the less-than character was lost, that caused problems and the double minus on the SPT- and DIGITS- was replaced. Try this code and let us know if it works for you. It compiled for me, but I don’t have the actual circuit setup at the moment. Thanks for stopping by and apologies for the headache. Damn, Yeah, the site hosed the code. Any line that contains the ‘\’, retype it, manually. Also, make sure the double quotes are actually double quotes and not the open/close double quotes. I need to use the code tag from now on, I see that. My mistake. Also, the libraries are, likely, fine. It is the crappy formatting from my page that is your problem. When I get time, over the next couple of days, I’m going to repost the code, using the right format. I assure you, this code does work. Again, apologies for the problems. I think I know why the got stripped out…HTML tags. Didn’t think about that. Awesome! Glad it helped and glad to be of help. You are welcome! Stay tuned, I have more coming. And, remember, https://halfbyteblog.wordpress.com/! (Shameless plug!) Thanks for stopping by. Very nice, let us know when you finish it. If you like, you can write up a short ditty on what you did and how did it, a photo or two and I’ll put it up on the blog. I would be interested in seeing your 3d printed enclosure, that’s one of the next things I want to get into, 3d printing. No, I won’t buy a kit, it will be assembled. There are a few in the two to four hundred range. Small, but functional. Prices should come down even more…I hope.